It can be said that nearly all of the early Gottlieb solid state machines were an exercise in form over function. 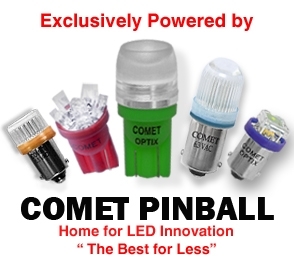 We’ve spoken a lot about the perils of Gottlieb’s System 1 boardset here on Credit Dot–I dedicated an entire article to Gottlieb’s fall from atop the pinball mountain once solid state technology became the industry norm. I don’t know why, but I have a soft spot for these rudimentary, simplistic, one-dimensional games that Gottlieb put out between 1977 and 1980. Where the gameplay is lacking, the art package more than makes up for it. Charlie’s Angels is a curious case: the art package is up there with the best of the period and it tried to do adopt some pretty elaborate rules (bucking the simplistic limitations of the hardware), but is generally regarded as a ho-hum forgettable Gottlieb offering. By 1977, Columbia Pictures had taken over Gottlieb lock, stock and barrel. The studio giant wanted to diversify its global brand into other forms of entertainment–they already had their hands in music and television, so the arcade was the next logical place to claim dominance. On paper it was a slam dunk: they absorbed a company that was at the very top of its game, nearly unrivalled for pinball supremacy in the early-1970s. Who knew that Gottlieb’s industry supremacy would grind to a halt once the solid state era was ushered in. You can play the blame game here all you want–Columbia mismanagement, uninspired game design, unreliable parts–but I think it was a perfect storm of many factors at Gottlieb paired with the performance of their pinball contemporaries. Reading between the lines, we see the reason for the disconnect on Charlie’s Angels: it was a test design for System 1 games to see how the solid state operating system would perform. Charlie’s Angels was released in November of 1978, a month before Gottlieb released both Dragon and Close Encounters of the Third Kind. If I had to guess, I’d say that the licence for Charlie’s Angels crossed someone’s desk, and it was quickly paired up with Edwall’s test design to get it out onto the street as soon as possible. If, say, the art package for Dragon was paired with the test design, perhaps it may not have fared as well. However, pair it with the images of everyone’s favourite female crime fighting trio and the cumbersome layout stood a fighting chance at holding the customer’s attention. They made an absolute ton of these games, nearly 8,000 units, which sounds impressive, but puts it at the middle of the pack numbers-wise of all System 1 games. 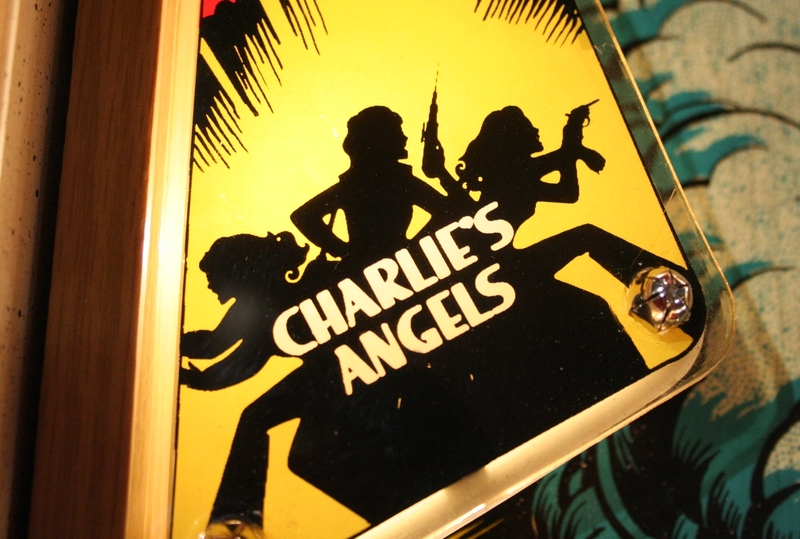 Despite the high production run, Charlie’s Angels isn’t a game that is seen all that often in private collections or retro arcades: one can guess that many of these games found their way to the junkyard after their arcade runs, due to their operating system unreliability (one can draw the same conclusion for the low survival rate of many of the Gottlieb System 1 titles). An electromechanical version of the game was also release in far fewer numbers, 350 units, to appease operators weary of changing over to solid state technology (many of these skeptical ops were European buyers). The game would have first hit arcades during the Angels’ third season. 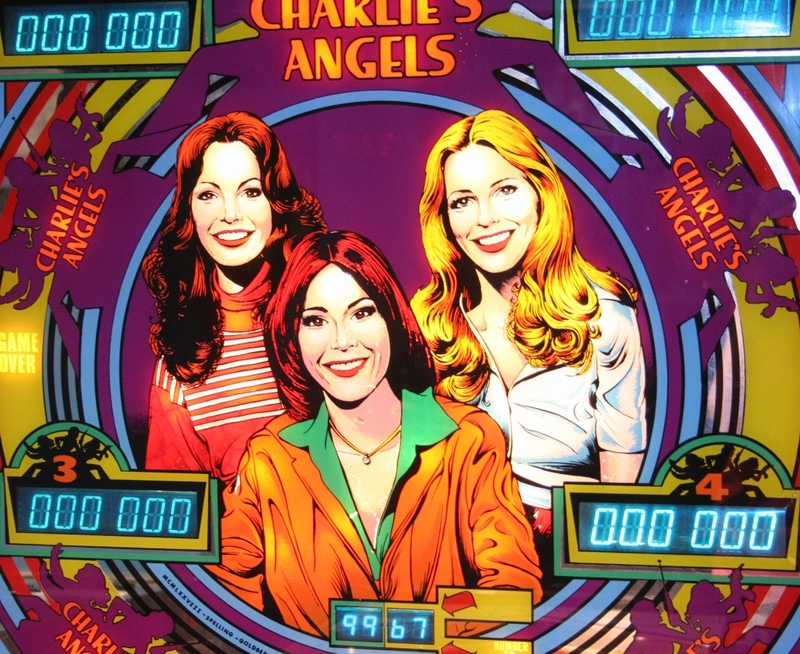 The backglass features Kate Jackson, Jaclyn Smith and Cheryl Ladd, who were the Angels du jour at the time of production. The most iconic angel, Farrah Fawcett, had left the show after the first season to pursue other ventures (resulting in a messy contract dispute), which explains her absence. Any casual consumer of popular culture would surely name Ms. Fawcett if asked to name an actress on the show, despite her appearance in only about one-fifth of the total Angels episodes produced. Fawcett did return to the show during this third season for guest spots in a handful of episodes which bolstered ratings slightly, but overall, it was the season that marked the end of the show’s cultural relevance. Time slots changes and a revolving door of actresses in “Angel” lead roles didn’t help matters. 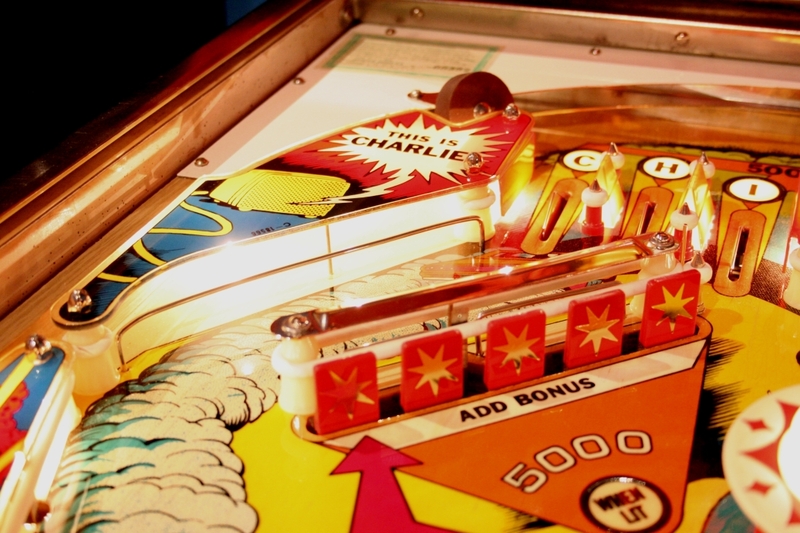 The property was red hot in its first season with Fawcett on the payroll, and perhaps Fawcett’s absence from the pinball machine’s art package is why this machine isn’t more sought after in the collecting community. The oranges, purples and yellows on this machine just pop and will make it stand out in any lineup of games. It is kind of disappointing that artist Gordon Morison wasn’t given more leeway with the licence—the actresses that portray the Angels appear only once on the mirrored backglass, and then just once more on the playfield, depicting the very same pose that appears on the glass. 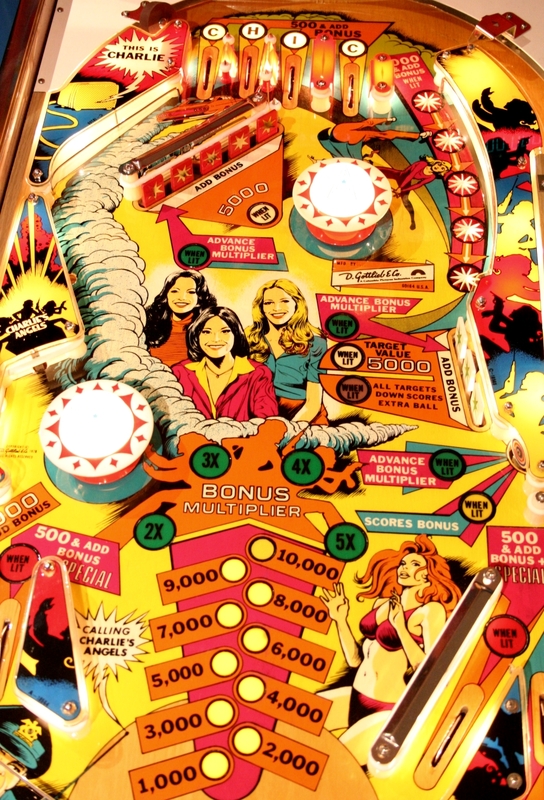 There were some disconnected choices for the playfield art: a dancing red-headed girl, a cartoon policeman and a blonde in a purple leotard flinging a man by his arm into the upper pop bumper. None of these people bear any striking resemblance to characters in the show, unless that cop is supposed to be an undercover Bosley. The playfield is busy with colour (that’s a good thing) with pinks, oranges and blues on a yellow background. Arrows point in nearly every direction indicating rule and scoring changes, but Mr. Morison does his best to organize it in such a way that it doesn’t seem cluttered. I am a fan of the curl of smoke that arcs under the Angels as a 70s muscle car peels away behind the five-bank of drop targets. Gordon Morison is at the top of his game here, using flash, dazzle and colour to draw attention away from the fact that there is little to tie the licence to the game other than a heavy reliance on the iconic Angel outline. And then there’s gameplay. The game has a quirky set of rules that may have been deep for the time, but overall, end up bogging the game down. Whereas System 1 cousins Cleopatra and Totem have a clear objective to achieve (lighting all five coloured pairs in the former, and lighting the drop targets via the rollovers in the latter), Charlie’s Angels really doesn’t have a readily apparent objective past bashing drop targets. Like many other games in the System 1 family, points boil down to the bonus and its multipliers. If there is a chase in the ruleset, it comes from tracking down the multipliers, and it takes a pretty good memory to do so. The multiplier will advance by completing the 5-target bank or completing the C-H-I-C rollovers (the C’s are connected, roll one C and you get both). Further, if 2X is lit, you can collect a multiplier at the stand-up bulls-eye on the lower right. If 3X is lit, you can collect a multiplier at the first target in the 5-target bank. If 4X is lit, you can collect a multiplier at the first target in the 3-target bank on the right. Got all that? Good. See if you can follow me on how the rollovers work. Further to advancing bonus, the letters H and I will reset the 3-target bank and increase their value to 5,000 points each. If you can roll over H when your bonus ladder is full, it’ll light the 3-target bank for an extra ball (yeah, you gotta knock them all down to collect). As you can see, this right bank of targets is pretty important. Star rollover buttons down the side of the game are connected to the downed targets in the 5-target bank, lighting each for 1,000, which is a decent payday for a rollover button. I said above, artist Morison organizes the writing on the playfield in a way that it doesn’t seem visually cluttered, however, the sheer amount of ruleset verbiage on the playfield is confusing. What isn’t written on the playfield spills over onto the apron card with more “If-Then” rules. The dead space alleyway between the upper rail and the 5-target bank. Balls funnel out from rollovers, but cannot be shot back up thru them. The game has a kicker arm on the bottom right by the dancing ginger bikini girl, and another up top just to the left of the Angels. This upper left kicker is a spot of trouble with indirect hits and dribbling balls, as it likes to send the ball careening toward the right outlane. The slow dribbler happens often in this area as there is a channel between the 5-target bank and the upper rail which is fed by the C and H rollovers. This channel has always concerned me, as seems out of place as a dead zone. I was troubled that I could never get the ball up into the area with enough force and accuracy to get it up and into the rollovers from the bottom right flipper. In all honesty, I thought I had re-assembled my game wrong after tearing it down. I have come to the realization that it is more of a one way ball exit from the rollovers, and it takes a lucky shot to get it up through a rollover lane from the bottom: I’ve only done it once. It is a bit of a wasted space, but at least it randomizes the ball movement after exits the CHIC lanes: pop bumpers normally do that, but Charlie’s Angels has just one pop under the lanes. The other pop resides lower down on the playfield, dangerously close to the flippers. This pop, like the upper kicker, likes to send the ball over to that troublesome right outlane. If nothing else, the game can be commended for its asymmetrical layout, which is a nice contrast to the symmetrical layouts of other Gottlieb games of the era like Cleopatra and Pinball Pool. Angels game designer Allen Edwall is an odd figure in pinball history. He designed Centigrade 37, which, for many, represents the high water mark of late electromechanical game design, but if you look at his resume, he was mostly in charge of Gottlieb’s solid state hardware design and software development. That explains his less than prolific run as a designer: he had plenty of other duties in his job description. Centigrade 37 was his first game, and I think we can agree, looking at the other games he designed, he wouldn’t have a hand in designing another game that matched the timeless popularity of his first. Charlie’s Angels downfall may be that a “computer guy” was in charge of the design. The game suffers, in spite of trying for a cumbersome and esoteric set of “If-Then” rules that tested the bounds of the early solid state system. In this day and age, folks call a cumbersome set of rules on a game “deep”. However, on early games like this one, that have to rely on the written word to explain what’s going on, it just gets really confusing. Compare the amount of playfield text on Charlie’s Angels to that of Joker Poker. Joker Poker has far less explaining to do, due to a more straightforward set of rules. Joker Poker is seen as the superior game because it uses its layout to keep the player engrossed, not a jumbled set of “If-Then” rules. Perhaps Charlie’s Angels was supposed to be a showcase of what the System 1 hardware and software was capable of through an intricate set of “When Lit” inserts, but I think it kind of backfired, making for a game that devolved into ignoring all the rules and simply hammering on the drop targets. As I mentioned, I have one of these games in my collection (for the moment). It arrived at my home in quite a frightful state, having been neglected in a barn or other type of out-building for many years. The boards were dead on arrival: corrosion and burnt transistors had taken their toll. With some tender loving care, a playfield touch-up and clear coat, backglass preservation, connector re-pinning, replacement parts from the Pinball Resource and a PI1x4 board from Pascal Janin, the game now looks and plays great (well, it looks better than it plays, given the discussion above). The Pascal PI1X4 board, which replaces all three System 1 backbox PCBs and the rudimentary cabinet sound board, is a superbly-designed compact board. In retrospect, it was a pricy addition to a game that doesn’t command that much money on the pinball market, but it certainly brought new life to a game that needed it and I picked up the game for quite a steal. The Pascal board adds extra rules to some of games in the System 1 family, but the additions to Charlie’s Angels are negligible: a roll-over skill shot and an extra ball re-light. Given the often questionable constancy of the System 1 boards, it is nice to have the extra assurance of stability that the PI1x4 provides. A refresh of the side cabinet art was also needed on the game, as the purple Angels had faded to a pathetic grey. I cut my own stencil, accounted for the trademark “Gottlieb overspray”, found a suitable colour match in a rattle can and brought the art back to life. I also went ahead and bypassed the PI1x4 sound components, which accurately mimic the early System 1 “bloops” and “bleeps”, opting to install a set of authentic Gottlieb chimes. The process was extremely simple, and the sound of those chimes really works to make the gameplay more appealing. From the FLIPPP! website: the amazing PI1x4 board that replaces all three backbox boards and the cabinet sound board. Less interconnect wires mean better stability. Better stability means less headaches! I’m unsure whether Charlie’s Angels will have legs in my collection. I think sheer pride in the fact that I brought the game back to life is keeping it around for the time being. If I had unlimited funds and space, which at the current time I have neither, I’d like to obtain a Bally Six Million Dollar Man machine to install beside the Angels and create the ultimate pinball shrine to 1970s hour-long, action drama television (there’s a bit of history there too, missing pinball Angel Farrah Fawcett was once married to Lee Majors, the Bionic Man himself). You can’t expect the world from a System 1 game as, admittedly, it was a transition period in the business. The cumbersome rules gave a bit more, but perhaps a bit more simplicity would have been in order. In essence, I’m asking for more and less all at the same time. Certainly the rules betrayed the game, and the layout did nothing to make up for its confusing faults. If Joker Poker represents the high water mark of System 1 games, Charlie’s Angels may very well bring up the rear. Many thanks to my beautiful wife for talking pictures of the Angels machine. You would have got some dumpy cell phone pictures otherwise. Also, I highly recommend reading PA Pinball’s interview with Charlie’s Angels designer Allen Edwall (I quoted from this interview in the article). It provides a lot of insight as to what was going on at Gottlieb during the System 1 days from Edwall’s perspective. It is a designer’s perspective that hasn’t been canonized in pinball history, and therefore, a valuable one. Categories: Featured Game | Tags: Allen Edwall, Bally, Charlie's Angels, Cheryl Ladd, Cleopatra, Columbia Pictures, Farrah Fawcett, Gottlieb, Jaclyn Smith, Joker Poker, Kate Jackson, Pascal, Six Million Dollar Man, System 1 | Permalink.